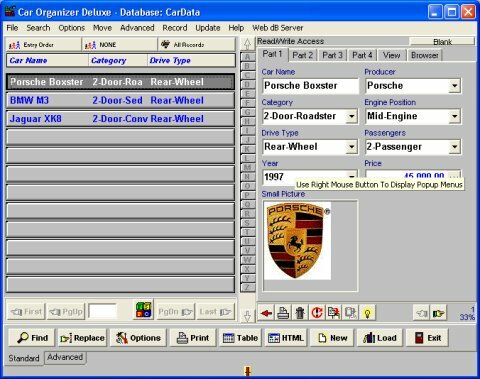 Car Organizer Deluxe is a Windows software for car collectors and hobbyists who want to organizer information about their favorite car models, car dealers who want to create a virtual car catalog, and individuals shopping for a new car who want to compare different cars. Car Organizer Deluxe is intuitive and easy to use for the beginner, at the same moment feature-rich and powerful enough to satisfy the most advanced users. ...... and displays the data efficiently, so that the information is readily accessible in a variety of ways. You can arrange information any way you want to view it. Flexible search, powerful filter, and multilevel sort functions allow you to find and retrieve information easily. Manage holiday greeting and card mailings. Qweas is providing links to Car Organizer Deluxe 3.7 as a courtesy, and makes no representations regarding Car Organizer Deluxe or any other applications or any information related thereto. Any questions, complaints or claims regarding this application Car Organizer Deluxe 3.7 must be directed to the appropriate software vendor. You may click the publisher link of Car Organizer Deluxe on the top of this page to get more details about the vendor.